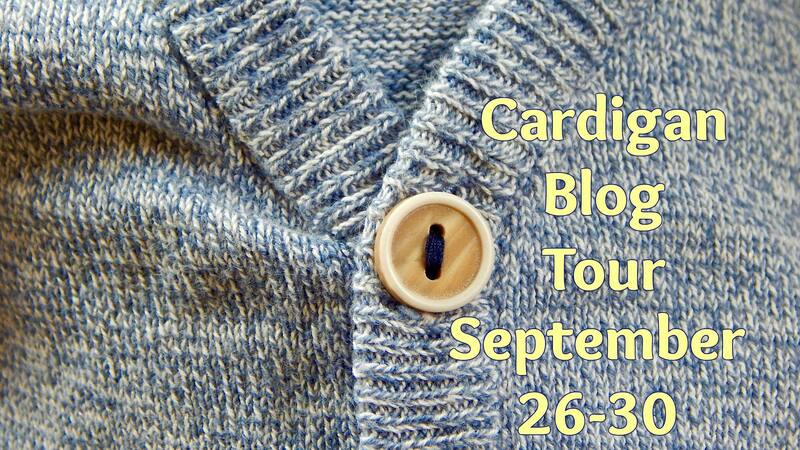 Am I showing my age if I sing along to The Cardigans while I write a post about sewing cardigans? I think I’m too old to care… Thanks to Tibeca for hosting and inviting me along for this tour! I have a bunch of patterns by Itch to Stitch (6 to be exact), and I’ve read such great reviews of her precision in patterning, details in construction, and overall fit and style. I don’t know why it has taken me so long to make my first, but I’m definitely happy that I started off with the Lisbon Cardigan! I wear cardigans almost every day to work. I naturally run cold, and that extra layer is a must for me. However, in the last few months, I have blown out the elbows in almost all of my RTW cardis, including my favorite red, grey, and mulberry colored ones. I wear each of them once a week or so, and I have been a little lost without them. 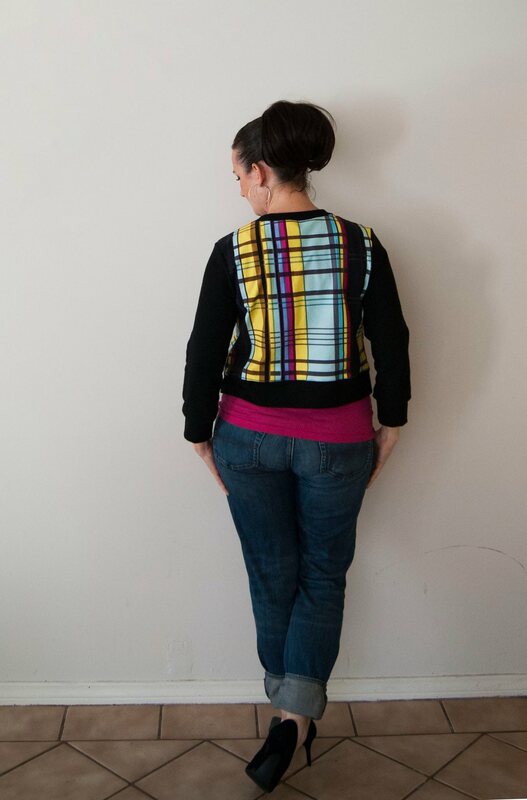 The Canyon Cardigans I made during testing have helped to fill the gap, but I really needed some classic twinset-style cardis to work with most of my work wardrobe. Enter the Lisbon! Fabrics Primary fabric should be a light-weight knit with at least 50% stretch; crochet lace works for the front panels. Details on my fabrics are further down. I started off with this amazing Metro Park Plaid by Piccadilly. 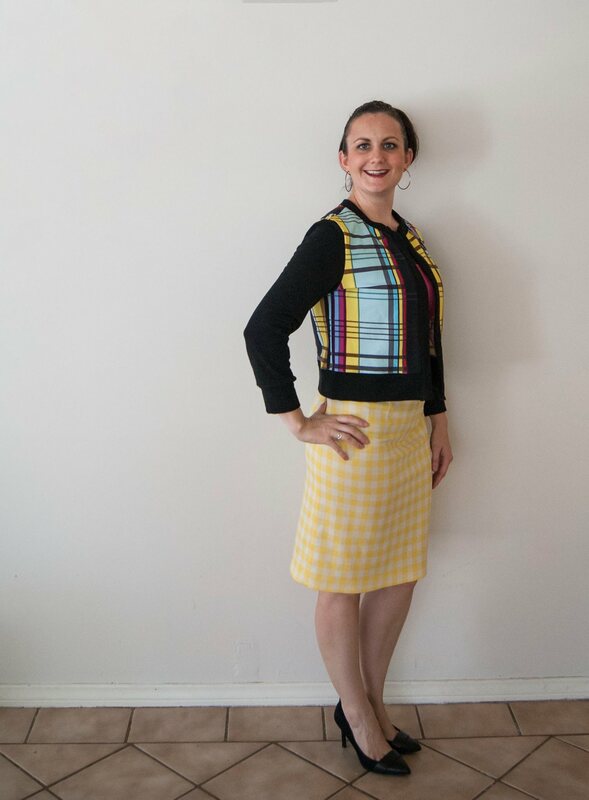 I only had a fat half (30″ x 36″) and I needed a pattern that would really feature the design, so this cardigan was perfect. I paired it with a solid black French terry from Purple Seamstress and it’s super cozy. This is the cropped length and 3/4 sleeves. I opted not to do my usual 1 1/2″ short torso adjustment, so it doesn’t actually look very cropped on me. I love it and it’s already a staple in my fall wardrobe! I also opted to not do buttons on this one, but I may add them in later. I also knew that I needed to directly replace some of my worn out RTW cardis. 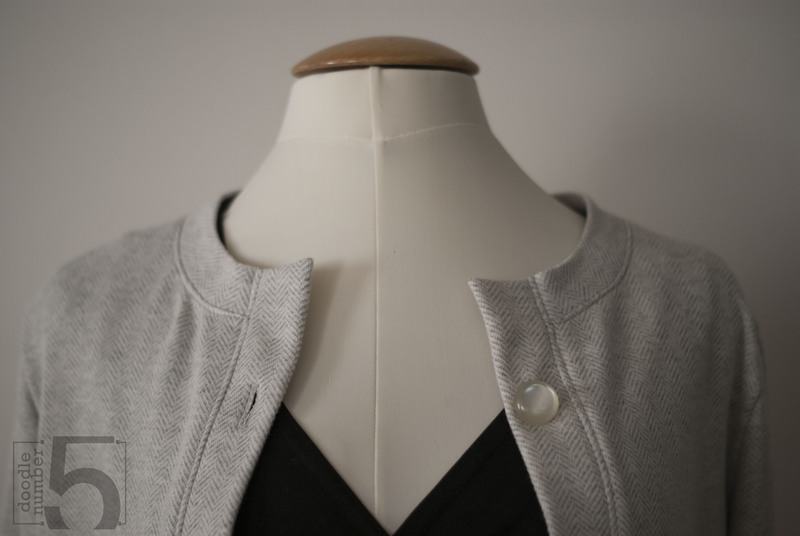 I scooped up a little bit of this very cozy light grey French terry on a summertime visit to The Loft. It was easily 90+ degrees in the shop, but I knew I would regret it forever if I didn’t bring it home with me. My initial plan was to use it for a super cozy raglan sweatshirt, but it’s actually perfect for this cardigan! I went with the full length/ long sleeves this time and used it for the main pieces and bands. Without a length adjustment, it’s just a smidge long on me, but I like it. It’s REALLY cozy. Look at the gorgeous details! The top-stitching is my own addition because it makes me happy, as do the giant faux pearl buttons. If, by chance, you’re admiring my super-sharp turned corners – I’ve got a mini-tutorial for you! As you approach the corner that is going to be turned, narrow your seam allowance by just a smidge. Like by the length of just a couple of stitches. You can backstitch or just run your stitches off the edge and tie the off – doesn’t matter. Trim your corner with a longer, shallow trim rather than a straight 45-degree trim you usually see. Turn and press and admire your sharp corners! 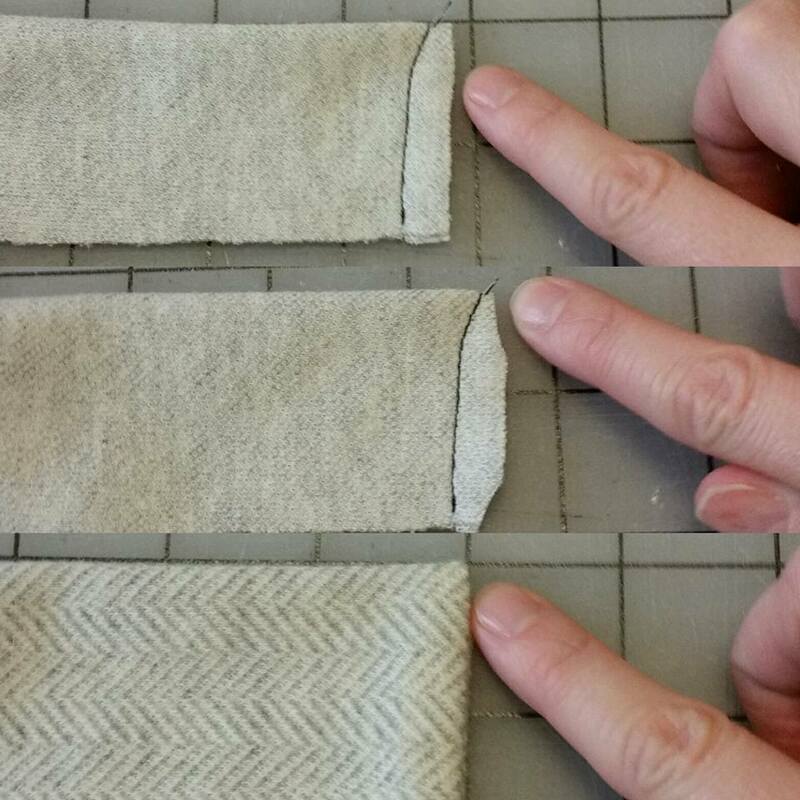 I learned this technique in a pillow-making book- I love applying these sorts of tips to all my sewing projects! 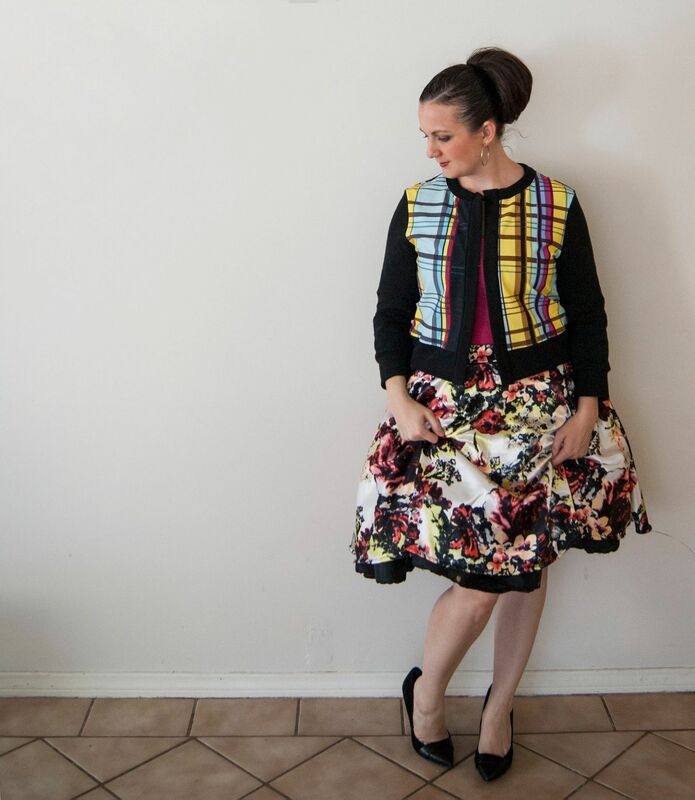 Make sure you follow along with all of the other fabulous seamstresses this week! Love both of these, but it was terrific seeing a French Terry version! Those corners are definitely on point (get it, on point, I kill me, LOL). That plaid is so wild and colorful. I love how you’ve paired it with different things to show that even though it is so fun, it is still super versatile. I love both your versions!!! I need this pattern now! Love them both, but especially the light grey! Gorgeous! Sharp! I just put the Lisbon into fall capsule. I have a nice Merino wool in my stash that will work well I think.